Having got out of the habit of blogging frequently, I'm finding it hard to get back to it. I have ideas that I want to write about, but they tend towards rather long posts, and I want to spend time getting them right, and I end up not writing them at all. Or if I do get something written, it's so long that I can't imagine anyone would want to read it. I have exactly the same issues inhibiting me from posting more frequently, and I've pretty much made the same "resolution": little and often, no need to research to the inth degree and don't worry if the post doesn't have a beginning, middle AND end. Happy month of blogging! 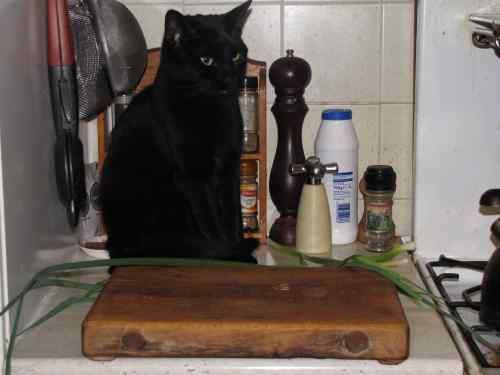 And hugs to George from another Black Cat Household. Exactly. "The best is the enemy of the good." I can't remember who said that, or whether I've got the words quite right, but you know what? I'm not going to bother looking it up. I suffer from the verbosity syndrome too. Back in April when I did my 30 day blogging challenge one of my goals was to keep each post short, but I fear I failed spectacularly. Oh well. I'm sure some of my posts will end up being far too long, but main thing is to get something posted every day, and not to delay because I want to get a long post finished properly before posting it. Thanks! I think it's likely that George will appear quite a bit, especially when I can't think of anything to write about.